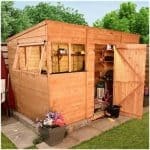 This fabulous large workshop has a solid construction and is built with security and privacy in mind. 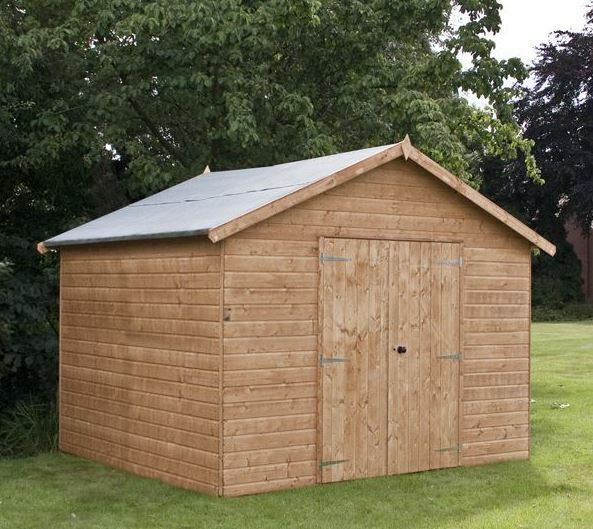 The 12mm Shiplap tongue and groove cladding really helps to provide a strong, secure and stable building. It even allows you to add shelving to the interior, further increasing its storage capabilities. The apex roof is a significant feature. Firstly it helps to provide protection against rot and damp related problems by draining rainwater directly off the building. It is also covered with a heavy duty sand felt. So not only is the roof protected from the elements, but it’s also protected against falling debris which could damage it in high winds. The second benefit the roof provides is added head space. Along with the extra tall eaves, you’ll find the interior of the workshop has a very tall, spacious design. There aren’t any windows included on this building so you won’t have to worry about your belongings being seen from the outside. It also provides plenty of privacy to work in. For added security, Waltons have also added a strong Rim lock to the double doors. So not only will thieves find it hard to break through the actual cladding, but they will also be deterred by the lock. Unpainted design. While this does provide a more rustic style, if you prefer a painted look you can always use a coloured treatment. 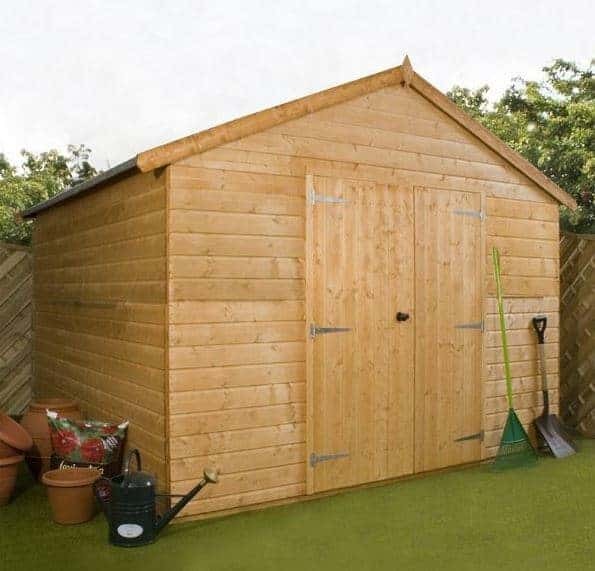 This is a premiere design wooden storage shed, offering a very large amount of internal space. It benefits from full tongue and groove cladding throughout, helping to add more flexibility to how the building can be used. For example, the strong floor ensures you can store heavy equipment and machinery. So this gives you the option to use it as a workshop or even a small home gym. 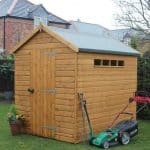 However, if you are thinking of using it as anything other than a general storage shed, it will require an electrical pack to provide power and light into the building. 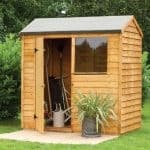 If this is the first shed you are buying, the measurements may not mean that much to you. 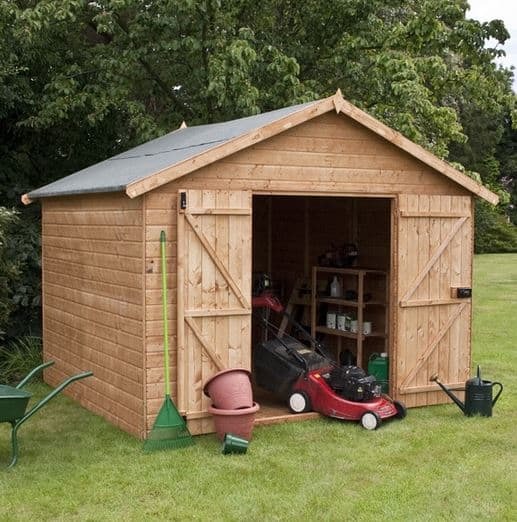 Although, if you compare them to other similar 10×10 sheds, you’ll find this model really stands out. The first notable benefit is the height of the roof. 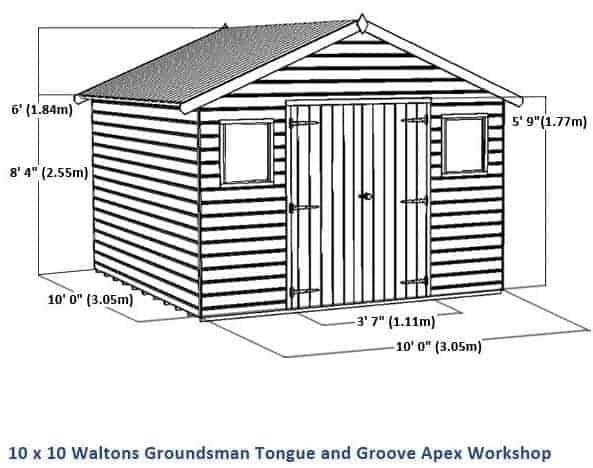 Now with apex designed sheds it’s a well-known fact that the roof is typically higher anyway. However, this one boasts an even taller design than standard. So you benefit from an incredible level of interior roof space, making it more comfortable as well as easier to store tall tools. The width of the doors is another notable difference. Now double doors isn’t uncommon on this size building, but what you’ll usually find is they tend to measure around 0.76mm wide. As these ones measure 1.16m in width, you can see that there’s quite a large difference. So you not only benefit from an extra tall building, but also an exceptional amount of access space. This building benefits from a wide apex roof, giving it a slightly different style to a lot of other workshops on the market. It has been covered with high quality, heavy duty mineral felt and has a very small overhang to prevent rainwater running down onto the timber. Apex roofs typically offer the best level of water protection, helping to seriously reduce the risk of rot. Whilst it may not be a massive difference, we still like that the apex roof on this building offers a slightly gentler appearance. Both the roof and the floor of the workshop have been made with 12mm tongue and groove materials. You won’t find this on all outdoor buildings and it does push the cost up a little. However, its benefits definitely outweigh the higher cost. With the floor this thick cladding is especially useful as it guarantees you can store heavyweight equipment without the worry of it crumbling underneath the pressure. It also makes it much more solid to walk over and is an essential feature for any workshop. What we find interesting is that Waltons have chosen to include a free floor support pack with this building. This is something we’d expect with buildings that come with a solid sheet floor. We feel the tongue and groove construction of the floor on this building eliminates the need for any strength upgrades. However, it’s really down to personal preference and as the pack comes free with the building, it makes sense to use it. We’re fans of the Shiplap cladding used on this workshop. There are three types of cladding that manufacturers tend to choose from and Shiplap is the highest quality available. On this building Waltons have used 12mm cladding and the tongue and groove provides a tight interlocking design. 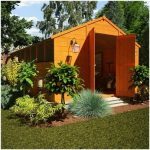 What this means for the shed is that it benefits from wind resistance as well as having a pretty strong barrier against rainwater. So it is protected against all the elements, helping to give it a longer lifespan. You’ll also find that the interlocking design has a very stylish finish. So if you’re looking for a workshop that looks good, as well as one that lasts for many years, this is a pretty good model to choose. The interior has also been finished to a high standard, making use of 45mm x 27mm framing. This is thicker than the framing you find in many similar sized buildings and it offers sensational overall support. Safety and style have also been considered during the construction of the frame. Waltons have planed and rounded it to stop the risk of splinters and to ensure it has the same smooth, professional finish as the exterior. Unfortunately the majority of wooden buildings do need to be treated and this workshop isn’t any different. Although it is pre-treated with a water based preservative, you are instructed to use your own high quality treatment once you’ve constructed the building. This will ensure you are entitled to the 10 year anti-rot warranty which comes included by the manufacturer. The frequency of treatment applications will depend upon the type that you use. Waltons supply a free tub of 5L Golden Brown water based treatment with this building. This is a water based treatment which adds more colour to the workshop, helping to give it a more attractive finish. It is safe to be used around pets and plants, is quick drying and boasts a great fade resistant design. Usually we’d recommend a spirit treatment, but due to the quality of the cladding, a water based treatment, provided it is reapplied once a year, can provide adequate protection on this building. They form a strong barrier on the surface of the timber, preventing any moisture from soaking through. As mentioned earlier, the doors really are one of the stand out features of this workshop. They benefit from an ultra-wide design, making it super-easy to transfer anything into as well as out of the building. It isn’t just their size that’s impressive. They also come with a strong, braced ledge design. Many outdoor buildings benefit from ledge doors, but they aren’t always braced. Basically this means there are diagonal beams running down the top and the bottom part of the door, stopping it from sagging. A Rim lock is also supplied to not only keep them closed when not in use, but to also keep other people out. This particular workshop doesn’t have any windows. Obviously this means if you are planning on working in the building as it is intended, you will likely need an electrical pack to add light as well as power and you will need to keep the doors open in hot weather to let in fresh air. 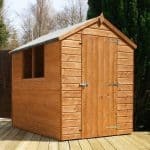 This workshop benefits from a really secure and private build. The Rim lock is a nice benefit. 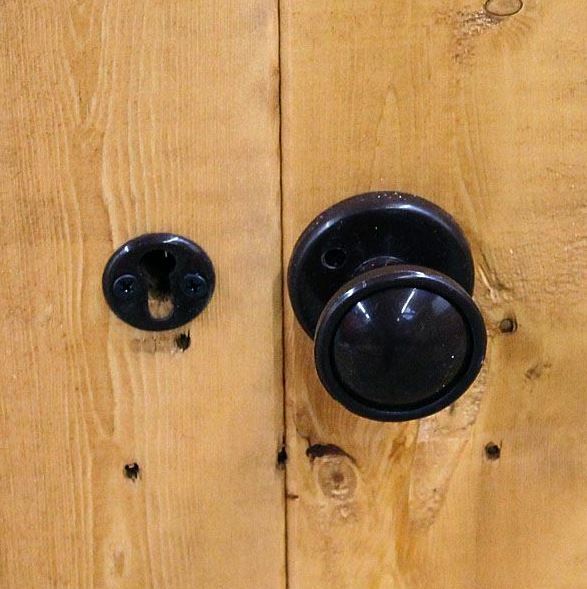 Fitted to the surface of the door, this type of lock is often used on Waltons sheds due to its aesthetic as well as its security benefits. You also have the secure 12mm cladding which would prove hard to break with a crowbar. The windowless style of the building also gives you the maximum level of privacy. So you have reassurance that when you work, nobody will be able to watch you from outside the building. You have three customisation options on offer with this workshop. The good news is, none of them are actually needed. However, that doesn’t mean you shouldn’t consider them. It just means if you’re trying to stick to a tight budget, you don’t necessarily have to spend any extra money customising the building. Superior duty felt is the first option available. This comes in a charcoal colour, the same as the heavy duty felt included with the workshop. Rather than sand, this felt has been made with fibreglass and it has a thick, solid design. It is more water-tight and will lengthen the lifespan of the roof if you decide to upgrade. We do find the felt included with the building is made to a very high standard, but it does feel a little thin. So this superior duty felt will definitely add to your peace of mind. A second option is to upgrade the floor. This is something we personally don’t think you need to worry about. For one thing, Waltons already give you a free 28mm floor support pack. So you can upgrade at no extra cost anyway. Even this free support pack isn’t really required as the tongue and groove floor is exceptionally adequate at handling the weight of heavier items. If you do feel you’d like to upgrade, you can buy the extra strength support kit. After all, you could argue that you can never have enough floor strength. The last customisation option you have is a choice of coloured water based treatments. As already mentioned, this workshop does need to be treated on an annual basis. As you are given a Golden Brown coloured treatment, you don’t need to worry about buying any additional ones for at least a year. However, if you fancy a different colour, you’ll be impressed by the range of Curpinol shades available. Holly, Lavender, Seagrass and Country Cream are just some of the colour variations available. We recommend taking a look at the entire range of treatments offered by Waltons before choosing one that best fits your preferences. As well as three great customisation choices, there are a small collection of accessories you can add to your purchase. 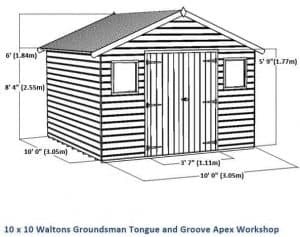 The one we most recommend is the 10×10 Waltons Pro Shed Base. We can’t stress enough the importance of installing the workshop on a very firm and level surface. 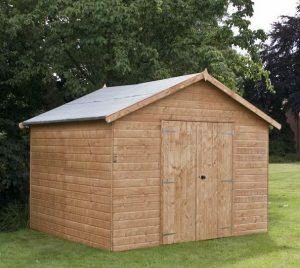 Whilst there are many shed bases available on the market, this Pro Base is one of the highest quality options out there. It is even created with an environmentally friendly design which makes it a great choice for those concerned with all things ‘green’. It manages to offer an incredibly strong base, whilst remaining lightweight and easy to store. It has been created with 100% recycled plastic and also adds ventilation to the building. A 49mm weatherproof padlock is also worth checking out if you want to further improve the building’s security. In our eyes you can never have too much security on outdoor buildings so we do highly recommend this little extra. Its design is fantastic, offering double locking and protected with a top quality Thermoplastic weatherproof jacket. The only other extras available are Draper accessories such as a cordless drill and spirit level set. These may be useful if using the building as a workshop and you don’t already have these tools in your collection. Draper is a leading provider of power tools and accessories so the quality you receive is 100% guaranteed. There’s nothing negative about the design of this workshop and even the framing has been constructed with exceptional quality in mind. It’s a great quality building that comes armed with a range of fabulous features. Despite the great thickness of the cladding and the super strong floor, you will need to treat the workshop to maintain ultimate durability. However, even without these treatments the building is still very hard wearing. As this is a big workshop, you already benefit from a good sized interior. However, the ability to hang shelves and hooks onto the inside walls is a great advantage. The 12mm tongue and groove floor is also capable of holding a lot more than solid sheet materials. If it wasn’t for how heavy the panels of the workshop are and the length of time it takes to build, we could have given this a much higher rating. What we do like is the simplicity of the instructions. Just expect a lot of hard labour. 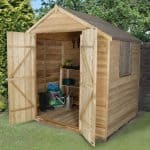 As there’s no immediate need to spend anything extra on this shed, we do feel it offers incredible value for money. Obviously there’s the annual treatments to think about, but you do receive a free treatment with the purchase of the building. Overall there are many features which make it more than worth the money you pay for the workshop. Final Thoughts: When choosing a workshop, security, privacy and strength are the main things to look out for. This great spacious building by Waltons provides all this and more. It’s one of the highest quality workshops we’ve reviewed and it even comes with a free tub of treatment and floor support kit. However, thanks to the overall 12mm tongue and groove construction, the building doesn’t really need the floor support pack, but it is good to have that little extra peace of mind. So if you’re looking for a durable, high quality spacious workshop, we highly recommend this model. Complete with its windowless design and Rim lock double doors, it is a secure, private place to work and store your valuable tools and equipment.